Artist Lee U-fan, whose abstract paintings have become the subjects of art forgeries, took a look at the paintings the National Forensic Service identified as counterfeits for the first time Monday, but said he has yet to conclude if they are fakes. “I will come back (to the police) the day after tomorrow. There are things I have to check again,” said Lee as he left the Seoul Metropolitan Police Agency after having examined the paintings. Lee’s attorney Choi Soon-yong explained that Lee would take time to compare the paints and techniques used in the counterfeits against his own and meet the police again Wednesday to deliver his opinion. “He has not been creating the same paintings, or using the same paints. The paints may or may not be the ones he used before,” said Choi, who was with Lee during the viewing. “He is being very careful in confirming whether the paintings are fakes,” he said. Lee, who had been staying in France for a month, arrived in Seoul on Sunday to finally have a look at the 13 paintings the NFS identified as counterfeits. He is expected to leave for Shanghai at the end of the month. “The artist is confused and offended, as he became the center of controversy against his will,” Choi added. Lee has insisted he needs to see the paintings since the NFS and the SMPA confirmed them as counterfeits. “The police never called me during the investigation. They did whatever they wanted to do,” Lee was quoted as saying by Yonhap News Agency upon his arrival at Incheon International Airport on Sunday. 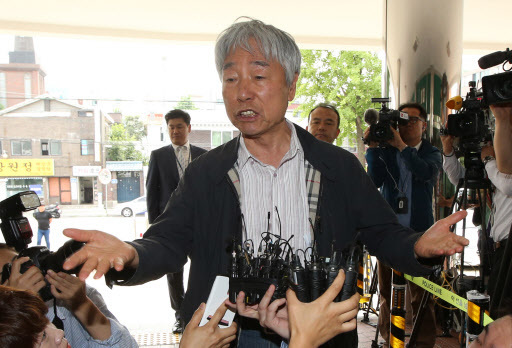 His remarks show his deep discontent with the police investigation into one of the largest art forgery cases involving the internationally acclaimed artist’s works in Korea. A 66-year-old art forger surnamed Hyun, who was arrested in May and charged with creating fake works credited to Lee U-fan, has been put on trial. The National Forensic Service earlier this month confirmed as counterfeit all 13 works police seized from galleries alleged to have been distributing the pieces.